A good model does not reduce the complexity of human life to a view that just one branch of science has to offer. It should recognize that being human is tangible, experienced and socially formed at the same time. Right down to the core. To represent the threefoldedness of human life we choose on of the oldest symbols: a triangle. 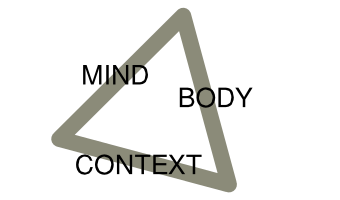 We use an even sided triangle to express that all aspects of being human depend on each other. Body gathers together being human as a physical being. We can study our biology, physics and chemisty to learn how tremendously complicated our body is. Mind refers to our mental processes. Some of them are concious and most are unconcious to us. All meaning and purpose lie there, as does experienced representations of physical world. Context is the situation we live in. It consists of relationships, culture and physical surroundings that interact with our body and mind. When we start to develop as a collection of a few cells, our body and mind begin to form in a specific context. Being human consists of all those three aspects right from the beginning. And interaction and interdependance of those three aspects continue through our lives forming our experience of being human.